Democratic congresswoman Tulsi Gabbard has provoked a backlash from senior Democrats after refusing to take Syrian President Bashar Assad’s complicity in the Idlib chemical attack at face value and demanding proof. Speaking live on CNN in the aftermath of the US missile strike against the Syrian airfield near Homs, Gabbard said she remained “skeptical” of the allegations, and reminded the host of the destructive invasions in Libya and Iraq, the latter based on a false intelligence pretext. The Democratic representative from Hawaii also called out US President Donald Trump for the “reckless” and “unconstitutional” attack. The remarks infuriated some “progressive” Democratic figures, including former Democratic National Committee (DNC) chair Howard Dean and former Hillary Clinton policy director Neera Tanden, now the President of the Center for American Progress, a pro-Democratic Party think tank. The two suggested on Twitter that Gabbard, who also famously visited Syria for a covert “fact-finding” mission, should be expelled from Congress for her doubt of Assad’s guilt. “People of Hawaii’s 2nd district – was it not enough for you that your rep met with a murderous dictator? Will this move you?” Tander wrote on Twitter on Friday, referring to Gabbard’s recent comments she made to CNN. — Neera Tanden (@neeratanden) 7 апреля 2017 г. — Howard Dean (@GovHowardDean) 9 апреля 2017 г. 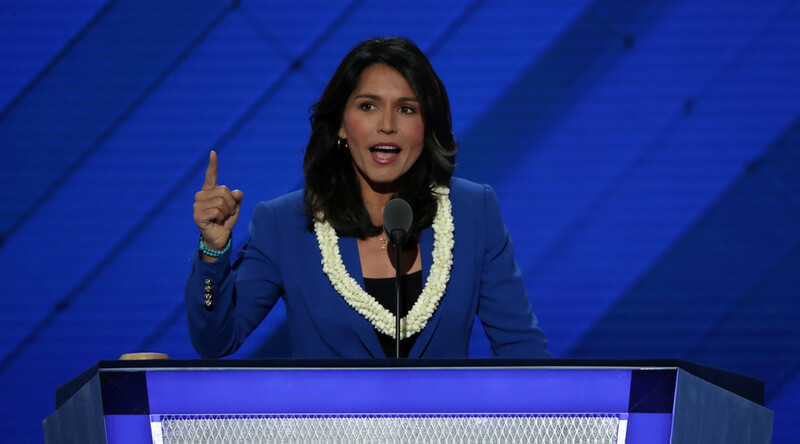 In an interview to the channel which aired on Saturday, Gabbard refused to be convinced by the undisclosed evidence that Trump and Secretary of State Rex Tillerson have cited when justifying the launch of 59 Tomahawk missiles against a Syrian airbase. “Whether the President or the Pentagon or the Secretary of State say they have the evidence the fact remains that they have not brought that evidence before Congress, they have not brought that evidence before the American people and have not sought authorization from Congress to launch this military attack on another country,” Gabbard said. Escalating Syria regime change war = more children and innocent people dying. #ResistTrumpsWar now. The congresswoman courted controversy after going on a private fact-finding mission to Syria earlier this year, after it was revealed that she met with Assad, as well as with civil, religious, and opposition leaders and civilians. “Their message to the American people was powerful and consistent: There is no difference between ‘moderate’ rebels and Al-Qaeda / Al-Nusra or ISIS – they are all the same,” Gabbard said at the time, drawing strong criticism from the US establishment, with many accusing her of cozying up to Assad. She has been a vocal opponent of Washington’s support for the rebels in Syria, arguing that weapons often end up in the hands of the terrorists. — 🦉WesleyZ3🦉 (@50th_President) 9 апреля 2017 г. — Krk (@RKirkRow) 10 апреля 2017 г. You can believe we shouldn't intervene, but Tulsi Gabbard is pretty indefensible for her denial of any wrongdoing by Assad, IMO. — 👩🏻‍💼 (@bitchyologist) 10 апреля 2017 г.